The average American will hold 10 different jobs between the ages of 18 and 38, averaging a different job every two years. Whether it’s a lack of job satisfaction or simply moving onto greener pastures, the current generation of workers doesn’t seem to hold a job for very long. Whatever the reason, it can be hard for companies to find loyal employees. Such as Carlos Duran. He’s been working at Saleen for 12 years, starting as a shipping clerk and working through the rankings to eventually become the sales manager for Speedlab, Saleen’s aftermarket division. Of course, it’s probably easier to like your job when you get to work with high-horsepower Mustangs all day. It wasn’t long before the Speedlab team turned up the wick even further. They wanted to offer their customers as much horsepower as possible and so began testing the limits of the stock bottom end. The result is the Speedlab 550hp supercharger kit, available as a complete system or as an upgrade for current Saleen owners. Not long after, Speedlab launched its line of 302ci crate engines, and, of course, one found its way into Carlos’ Mustang. The new aluminum 3V block came complete with a Saleen-spec forged rotating assembly, including aluminum pistons, steel connecting rods, and a Kellogg stroker crankshaft. American Racing Headers also provided a set of its longtube headers and an x-shaped crossover setup to help the exhaust system breathe easier. With the supercharger pushing out 12 pounds of boost, the Three-Valve motor produced 505 hp and 495 lb-ft torque at the rear wheels. New drivetrain components were needed to handle the extra power, and a Tremec 6-speed transmission, SPEC Stage 2 clutch, and a one-piece aluminum driveshaft made their way into the car. You might think the guys at Speedlab only care about going fast, but Carlos wanted the Mustang to be visually appealing as well. 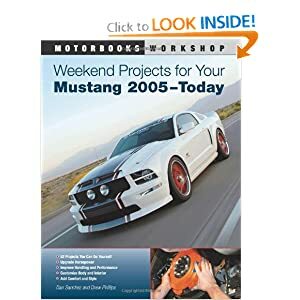 The standard Saleen body kit served as a great starting point, but he wanted a unique look, different than any other Saleen Mustang. The result is both retro and modern, combining a variety of components from the Saleen parts bin, as well as a few custom pieces. Quarter-window panels and rear-window louvers were sourced from Saleen’s Heritage body kit, and the carbon fiber rear diffuser came from the S302 Extreme Mustang. More carbon fiber continues along the lower portion of the car and is used for the custom side skirts and chin spoiler, both of which will be available from Saleen Speedlab in the near future. Carlos finished off the exterior with black, five-spoke Saleen alloy wheels, wrapped with Pirelli PZero Rossa tire, 275/35-20 front and 305/40-20 rear. The interior came with several upgraded standard on the S281, including custom leather seats, 200 mph gauges, dash-mounted gauges and a short throw shifter, but as with the exterior, Carlos wanted something a little more unique. “I talked with our fabrication shop and asked them to adapt the Saleen S7 race seats to the Mustang with all the stock seat features,” he says. They managed to make it work, and the seats were in the car just a few months later. They not only look great but also weigh 40 pounds less than the stock seats. As with the exterior, carbon fiber is used throughout the interior, including a custom rear-seat delete, door sills, and the armrest cover, all soon to be added to the Speedlab catalog. Even though the Mustang was already one of a kind, Saleen was going to display the car at SEMA and wanted to come up with something that no one else had done. Saleen’s engineers had started development of a functional ram-air system that would work with the Series VI supercharger system, and the team rushed to build a working prototype in time for the show. They managed to do so, and the feedback they received at SEMA was overwhelmingly positive. The go-ahead was given for a production version, dubbed the “SuperShaker,” the first of which is seen on Carlos’ Speedlab Mustang. Saleen will offer SuperShaker kits as well as upgrade kits for Mustang owners who already have a Saleen supercharger, and even an upgrade for owners of the Parnelli Jones Mustang. As shown in the photos, the SuperShaker grabs cool air from outside the engine bay and drops it directly into an airbox and filter that sit just ahead of a 62mm twin-bore throttle body. The benefits of the system can be easily seen and felt. Throttle response is improved, the engine runs much cooler, and horsepower and torque both increase. Then there’s the sound. “It sounds more like a jet than a Mustang,” Carlos says, laughing. “The sound scares me. It reminds me of our old S351R with its meaty, throaty whine.” In its current form, the Speedlab Mustang produces a tire-shredding 540 horsepower and 530 lb-ft torque at the rear wheels. What does the future hold for the Speedlab Mustang? More power, of course. Carlos plans to add a set of CNC-ported heads, as well as a ported race version of the supercharger that is being co-developed with JDM Engineering in Freehold, NJ. He’s set a goal of 600 horsepower and 580 lb-ft torque at the wheels, and we don’t see any reason it won’t be reached.